The all-new Fiora is an ultimate wireless car charger it’s designed in Vancouver, Canada. It has created a new wireless in-car charger named the Fiora, car wireless chargers will let you charge your smartphone very easily without making you connect it to a cable each time. It offering 15w of Qi fast charge technology with easy and smooth touch auto lock and release sensor. Available from just £17, $ 22, 1531.97 rupee and CAD$29 the wireless charger is now available to back via Kickstarter and is compatible with the latest Apple smartphones in the form of the XS, XR, X and iPhone 8. Just like many of you, the development team consists of people from all walks of life. Whether you are a working professional, a parent, or even a student, it doesn’t matter what you are. We all use our cellphones or Smartphones in our day to day lives and it has become even more important nowadays to make sure your phone is always charged and connected. You never know when that crucial time will be when you need to reply to that time sensitive email or text message. The idea of wireless charging is great and awesome for those who have no time to charge their phones. It saves time, it’s convenient and it’s easy to use because smartphones can do many things at once but they still can’t hold a charge for longer than a couple of hours if you use it continuously That’s why it’s best to keep a charger at hand always. But what about when you in the car? What you do at that time It’s where you need to focus on the road rather than plugging a charger into your phone. Just drop it in, and watch it charge! It’s that easy! This is what makes Fiora wireless car charger so unique they allow you to get in the car and simply place it on the holder. Worried a lil bit that a wireless charger doesn’t deliver the same power as a wired one? Fiora guaranteed that this provides fast charging then wired one. Not only are they functional, but the stylish appearance of Fiora car wireless chargers make them a good addition to your car’s interior design. You can get this completely awesome and cool product in a number of colors as well, so you can choose what best suits your personality. 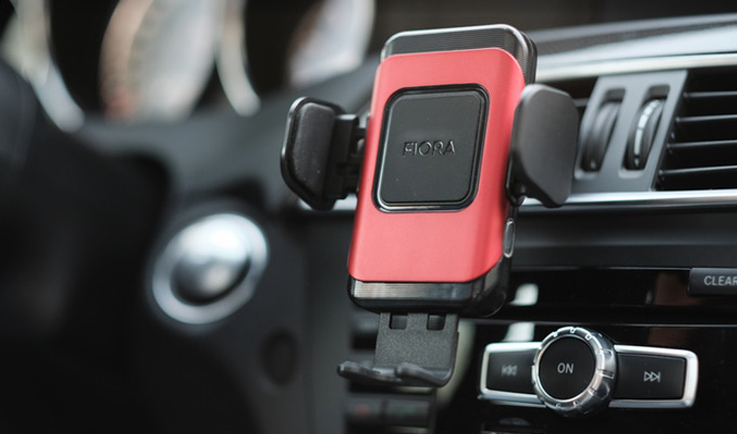 In case of your new Fiora car wireless charger gets damaged or broken then you can simply replace with a new one because of the 1-year product warranty on all of the products. Even, if you’re having trouble setting it up and getting it to work the first time, you can call anytime at Fiora’s 24/7 customer service. Keep charged and connected while on the road with the Fiora ultimate Wireless Car Charger. that includes a three-in-one design, this device includes a smartphone mount, video dash cam and wireless phone charger. With the ultimate Wireless car Charger, Whole you have to do is drop your device input for it to charge. no matter how you put your smartphone, the charger locks it into put automatically. Similarly, the adjustable foot caters to whole phone sizes while the silicone gripping holds the cell phone input for maximum charging efficiency. Compatible with Qi wireless devices, it works with most new phones on the market. providing quick charge capability, it charges at an incredible 15W. The device also comes with a QC 3.0 car adapter to enhance the charging speed even a lot of. simply tap the sensors on either side of the ultimate Wireless Car Charger for your phone to release automatically. It charges at an incredible 15W, the device also comes with a QC 3.0 car adapter to enhance the charging speed.